The emergency response to the London bombings on 7 July last year was flawed, a Home Office report based on the experiences of victims has found. The government praises the bravery of emergency workers but says procedures in areas including communications and medical treatment need to be improved. It highlights the need to quickly set up reception and assistance centres. Meanwhile, a separate report focusing on the agencies involved said planning had proved "very successful". The Home Office said improvements would be made to the casualty bureau system, emergency communication facilities and compensation procedures. "In times of crisis, information and support must be readily available and easy to access for those who need it," said Home Secretary John Reid. "Getting the right help in place is of critical importance and we are working hard to strengthen our emergency response." Culture Secretary Tessa Jowell, the minister charged with responsibility for liaising with survivors and bereaved relatives, said: "We've taken some very hard lessons and very practical lessons from what went wrong." The four suicide bombings killed 52 people and injured nearly 800. The Home Office's Lessons Learned report says there "can be no doubt that lives were saved" by the efforts of emergency workers. However, it says casualty bureau phone lines could not cope with the volume of calls from worried families. There is also criticism of the way many of the walking wounded had to make their own way home without receiving medical help or having given their details to the authorities. The report calls for suitable reception centres to be identified around the country that would become rallying points in the event of future incidents. Survivors are also said to have found the process of applying for compensation "bureaucratic, slow and distressing". And it supports the government's decision not to hold a full public inquiry into the events, saying such an investigation would "divert resources, in terms of personnel, away from the police and security agencies". The second report - Looking Back, Moving Forward - was published by London Regional Resilience Forum. 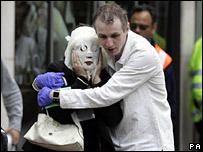 The coalition, made up of emergency services, transport, NHS and central and local government agencies, was set up in the wake of the 11 September 2001 attacks on the US to prepare for potential emergencies in the capital. "By quick, professional and effective action at the scene of each of the bombs, the situation had been contained and the potential additional loss of life and suffering considerably reduced," it said. It said the agencies were not over-stretched but the response did "provide an opportunity to identify areas that required further work to increase London's ability to successfully deal with future emergencies" . Poor communication - in particular an over-reliance on mobile phones - was cited as the "greatest single area of concern".